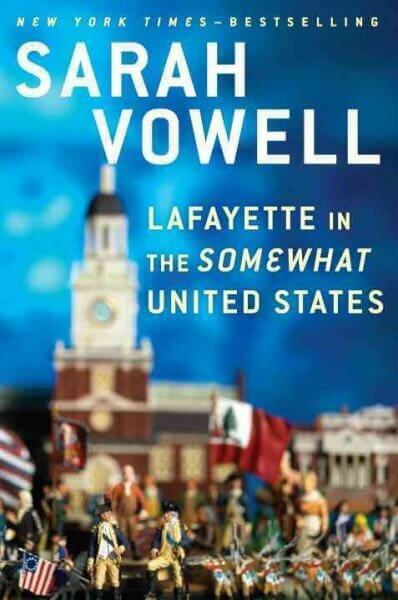 As a Fellow at the Nazareth College Center for Public History (or so I am told), I was delighted on Sunday to see Sarah Vowell’s new book Lafayette in the SOMEWHAT UNITED STATES (not sure how to reproduce that weird E in picture) reviewed and steadily rising on the New York Times bestseller list. Here, Vowell retraces the steps of Marquis de Lafayette in America. At 19, made a major general in the Continental Army, and then, in 1824 invited by President James Monroe on a grand tour as the United States celebrated its 50th birthday. 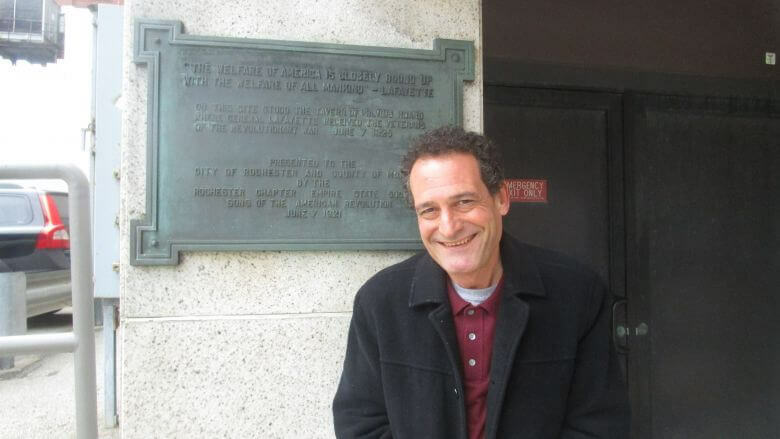 My interest rising, I did know that Rochester was on Lafayette’s tour that included stops along the Erie Canal. 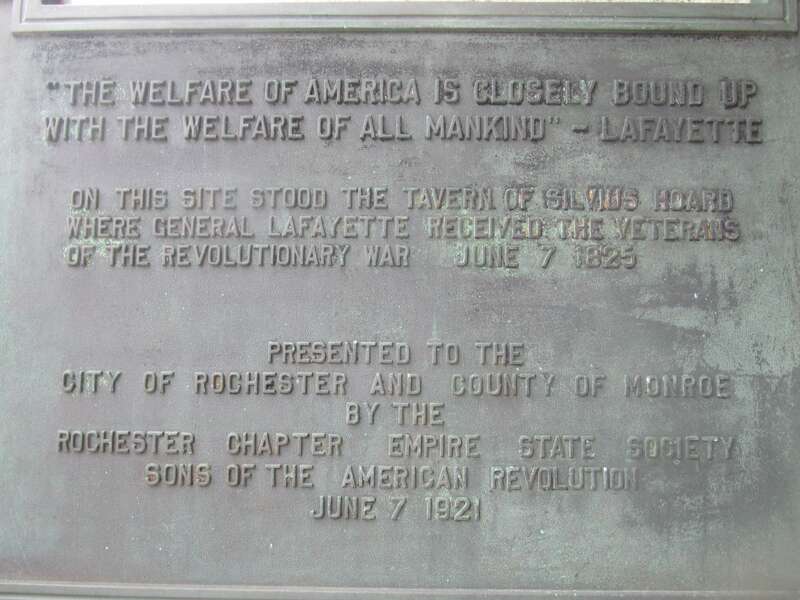 Coming from Lockport, on June 7, 1825 Lafayette stopped in downtown Rochester aboard an Erie Canal barge and met with a group of Revolutionary War veterans at the Clinton House (formerly the Silvius Hoard’s tavern). According to historian Blake McKelvey, at the event were an “estimated ten thousand cheering citizens” for the “Nation’s Honored Guest,” double the town’s population. Lafayette stopped briefly on the veranda of the newly opened Clinton House adjoining the canal on Exchange Street to receive the town’s official greeting, but he was soon taken by carriage on a tour of the village ending at Christopher’s Mansion where Colonel Rochester presided over a public banquet in his honor. 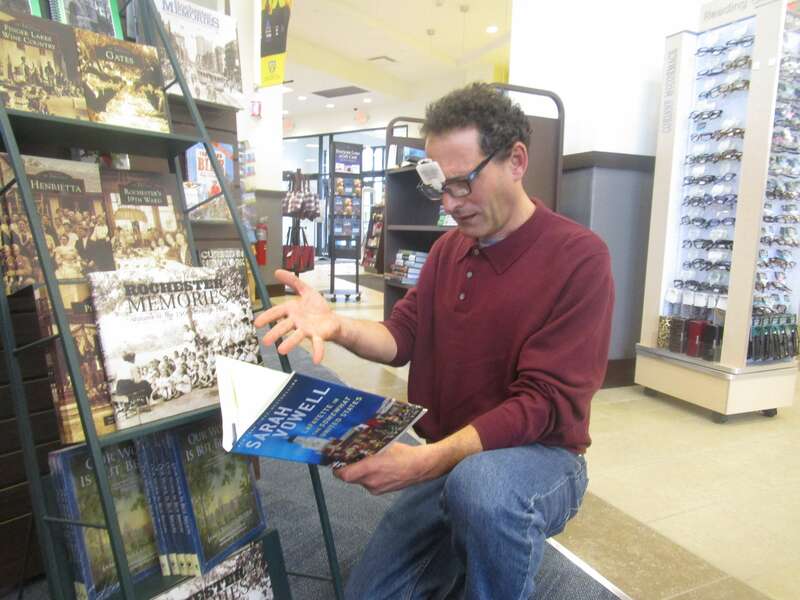 Wondering, did Sarah’s mention us?, I rushed to the Barnes & Noble at College Town. Alas, after having borrowed some B & N reading glasses to scan the fine print in the index, disappointment. No toasts from Nathaniel Rochester to be found. Note: the title of the post is adapted from a common saying or slogan of American soldiers and the public when the United States intervened in World War I on the side of France: Lafayette we are here. Sarah, we were there (on the Tour) too! For reassurance, I knew I had to see the plaque commemorating Lafayette’s visit that was somewhere in the somewhat downtown. It was not easy. 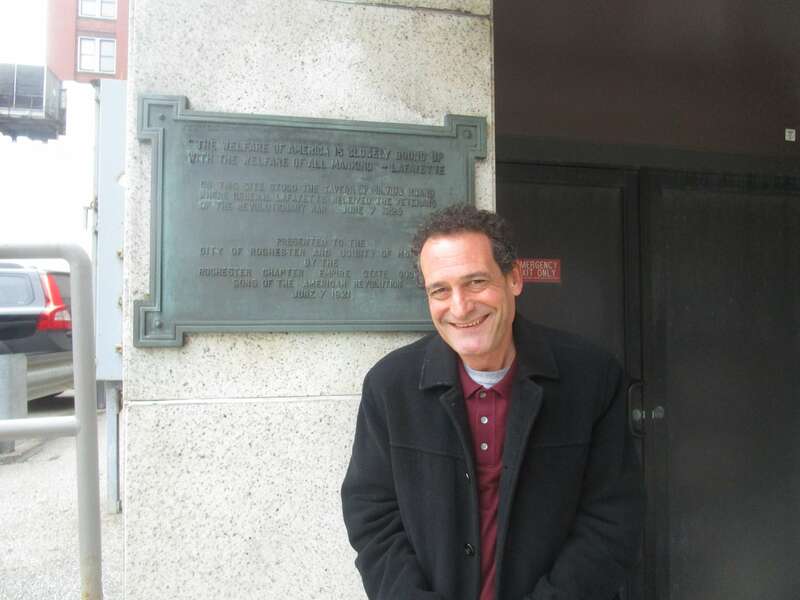 At City Hall, Donald Starver directed me to some history buffs in the building. Googling and brainstorming, we couldn’t quite find it. The search ended with City Historian Christine Ridarsky who was at the desk of Rundell’s local history room. 1 Exchange Street across from the Wilder Building. And so it was. UPDATE: That was Sarah giving a thumbs up, but the image has disappeared. Our second submission "A Phone Call to Manhattan"